In October 2017, Dundurn Press published Geoff Berner’s 2nd novel, The Fiddler Is a Good Woman. The book comes with a free download code for his new album, Canadiana Grotesquica. The album is also available on LP, CD and the usual digital sites, through COAX Records in North America, and 9pm Records in Europe. Clever and literate, Berner’s songs can make you want to weep, laugh, grind your teeth, or kick out a window–often all at the same time. His writing can be overtly political, overtly left wing, leaning towards anarchy, but free of easy slogans or cliches. His peers consider him a “songwriter’s songwriter” and many artists have taken the time to learn and play his songs, including Corb Lund, the Be Good Tanyas, RotFront and Rae Spoon. 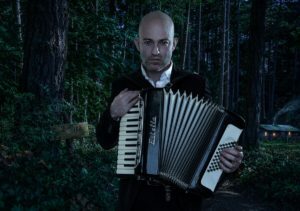 As a musician, Berner is mainly known as a practitioner of the “klezmer-punk” style, which combines the traditional folk music of Eastern European Jews with punk’s aggressive energy and disdain for slick perfection. The new album Canadiana Grotesquica is a brief departure. Berner describes it as a “country-tinged singer-songwriter affair.” It was produced by Paul Rigby, a brilliant arranger and guitarist, nominated for a Grammy for his work with Neko Case. The Fiddler Is a Good Woman is set mostly in the knockabout world of travelling independent Canadian “roots” musicians, and that world is also the source material for the music of Canadiana Grotesquica. With a new album, new book and tours of Canada, continental Europe, the Pacific northwest of the U.S., and Scandinavia, Berner is officially on a roll.